Interleukin 2 (IL-2) is a pleiotropic cytokine produced primarily by mitogen- or antigen-activated T lymphocytes . Human IL-2 (also known as T-cell growth factor) is produced by T-cells in response to antigenic or mitogenic stimulation. IL-2 is a potent lymphoid cell growth factor which exerts its biological activity primarily on T cells promoting proliferation and maturation. Additionally, IL-2 has been found to stimulate growth and differentiation of B cells, NK cells, LAK cells, monocytes, and oligodendocytes. IL-2 is involved in treatment of cancers such as melanoma and renal cell cancer. It plays a key role in promoting the clonal expansion of antigen-specific T cells. In addition, IL-2 has also been shown to mediate multiple immune responses on a variety of cell types. The sequence of mouse IL-2 cDNA predicts a 169 amino acid (aa) residue precursor glycoprotein containing a 20 aa residue signal peptide that is cleaved to form the mature protein . At the amino acid sequence level, mature mouse IL-2 is approximately 60% identical to human IL-2 . Whereas human IL-2 is active on mouse cells, mouse IL-2 is species-specific and is inactive on human cells . The gene for IL-2 has been mapped to mouse chromosome 3 . The biological effects of IL-2 are mediated by specific cell surface receptor complexes. The functional high-affinity receptor for IL-2 is composed of three distinct polypeptide chains . IL-2 stimulates the proliferation of thymocytes; stimulates the proliferation and differentiation of activated B cells; promotes the growth, differentiation and cytocidal activity of monocytes; induces the growth of natural killer cells and stimulates cytokine production by these cells as well as the cytolytic activity of these cells; enhances the production of lymphocyte-activated killer (LAK) cells; and induces the proliferation and differentiation of oligodendrocytes . Goldsmith, M.A. and W.C. Greene (1994) in The Cytokine Handbook, 2nd ed., A. Thomson editor, Academic Press, New York, p. 57. Hatakeyama, M. and T. Taniguchi (1990) in Peptide Growth Factors and Their Receptors I, Sporn, M.B. and A.B. Roberts eds., Springer-Verlag, New York, p. 523. Yokota, T. et al. (1985) Proc. Natl. Acd. Sci. USA 82:68. Kashima, N. et al. (1985) Nature 313:401. Taniguchi, T. et al. (1983) Nature 302:305. Fuse, A. et al. (1984) Nucl. Acids Res. 12:9323. Seigel, L.J. et al. (1984) Science 223:175. 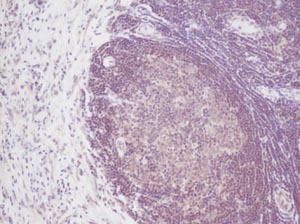 Immunohistochemistry: This antibody stained formalin-fixed, paraffin-embedded sections of human breast invasive ductal carcinoma. The recommended concentration is 2.5-5.0 µg/ml with an overnight incubation at 4˚C. An HRP-labeled polymer detection system was used with a DAB chromogen. Heat induced antigen retrieval with a pH 6.0 sodium citrate buffer is recommended. Optimal concentrations and conditions may vary. Tissue samples were provided by the Cooperative Human Tissue Network, which is funded by the National Cancer Institute. Immunohistochemistry. 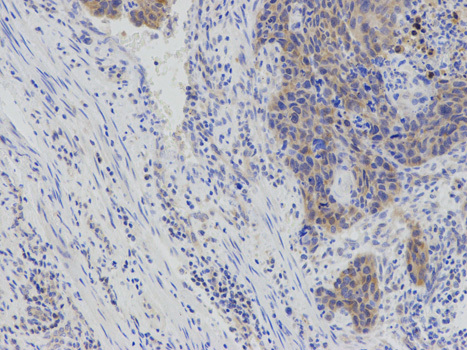 This Interleukin-2 antibody stained formalin-fixed, paraffin-embedded sections of human breast invasive ductal carcinoma. The recommended concentration is 0.125 µg/mL-0.250 µg/mL with an overnight incubation at 4˚C. An HRP-labeled polymer detection system was used with a DAB chromogen. Heat induced antigen retrieval with a pH 6.0 sodium citrate buffer is recommended.Tissue samples were provided by the Cooperative Human Tissue Network, which is funded by the National Cancer Institute. Western blot analysis of mouse IL-2 recombinant protein probed with RAT ANTI MOUSE INTERLEUKIN-2 (SM1698P)followed by F(ab')2 RABBIT ANTI RAT IgG:HRP (SP1021HRP). Western Blot analysis of IL2 expression in transfected 293T cell line by IL2 monoclonal antibody (M12), clone 1C1.Lane 1: IL2 transfected lysate(17.6 KDa).Lane 2: Non-transfected lysate. Immunohistochemistry. 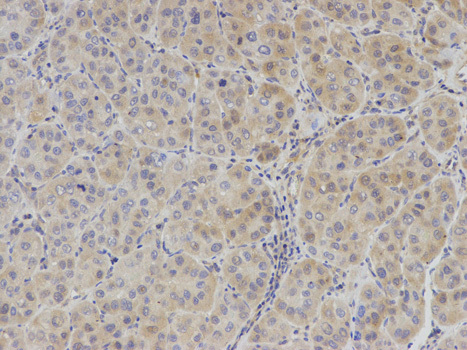 This Interleukin-2 antibody stained formalin-fixed, paraffin-embedded sections of human breast invasive ductal carcinoma. The recommended concentration is 0.5 µg/mL with an overnight incubation at 4˚C. An HRP-labeled polymer detection system was used with a DAB chromogen. Heat induced antigen retrieval with a pH 6.0 sodium citrate buffer is recommended. Optimal concentrations and conditions may vary. Tissue samples were provided by the Cooperative Human Tissue Network, which is funded by the National Cancer Institute. Western Blot analysis of IL2 expression in transfected 293T cell line by IL2 monoclonal antibody (M11), clone 1C5.Lane 1: IL2 transfected lysate(17.6 KDa).Lane 2: Non-transfected lysate. AP17501PU-N IL2 Antibody staining of Formalin Fixed, Paraffin Embedded Mouse heart tissue followed by peroxidase conjugation of the secondary antibody and DAB staining. 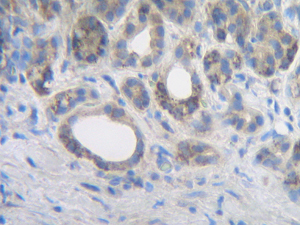 This data demonstrates the use of the IL2 Antibody (Center) for Immunohistochemistry. Clinical relevance has not been evaluated. Western blot analysis of AP17501PU-N IL2 Antibody (Center) in MDA-MB231 cell line lysates (35 µg/lane). IL2 (arrow) was detected using the purified Pab. 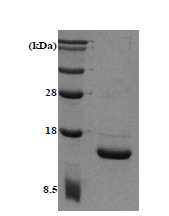 Western blot analysis of IL-2 antibody (Cat.-No. : AP20657PU-N) in extracts from HT-29 cells. 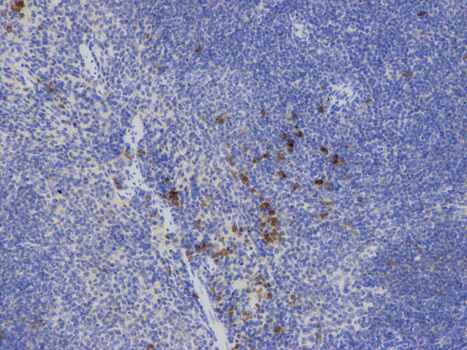 Representative DataClone N7-48A (anti-IL-2) was analyzed by flow cytometry. Peripheral blood (lymphocytes) were isolated from a blood sample obtained from a healthy volunteer and subsequently activated, fixed and permeabilized. Direct staining was performed using 10 µl of PE-conjugated monoclonal antibody in combination with 10 µl of anti-CD45 FITC per sample. Western blot analysis using IL2 mouse mAb against full-length IL2 recombinant protein with Trx tag (1) and full-length IL2-hIgGFc transfected HEK293 cell lysate(2). Flow cytometry analysis of IL2 in PBMC, staining at at 2-5ug for 1x106 cells (redred line). 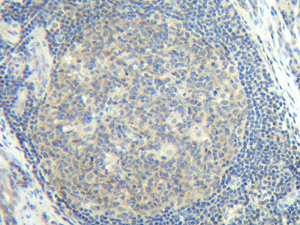 The secondary antibody used goat anti-mouse IgG mouse IgG Alexa fluor 488 conjugate. 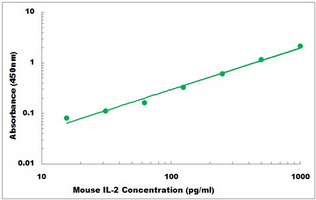 Isotype control antibody mouse IgG (black line). The recombinant protein (20ng) was resolved by SDS-PAGE, transferred to PVDF membrane and probed with anti-human IL2 (1:500). Proteins were visualized using a goat anti-mouse secondary antibody conjugated to HRP and an ECL detection system. Lane 1.: Recombinant Human IL2. Western blot analysis of IL-2 expression in CTLL2 (A) whole cell lysates. 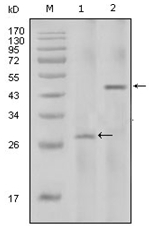 Western blot analysis of IL-2 expression in HEK293T (A); NIH3T3 (B); H9C2 (C) whole cell lysates. 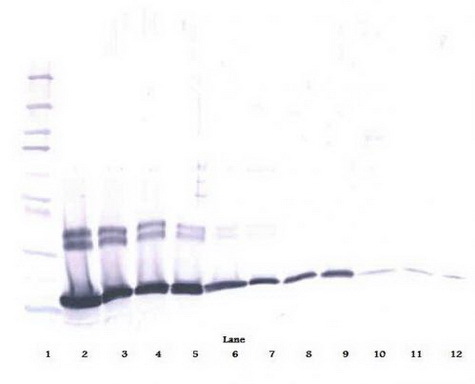 Western blot analysis using recombinant human IL-2. Lane 1: 50 ng, Lane 2:100 ng. 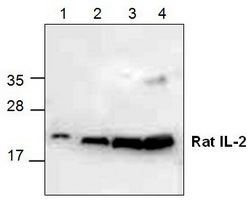 Western blot analysis of IL-2 using recombinant rat IL-2. 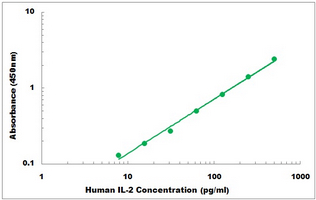 anti-Human IL-2 antibody shows detection of a band ~15 kDa in size corresponding to recombinant human IL-2. The identity of the faint higher molecular weight band may represent a homodimer. Molecular weight markers are also shown (left). After transfer, the membrane was blocked overnight with 3% BSA in TBS followed by reaction with primary antibody at a 1:1,000 dilution. 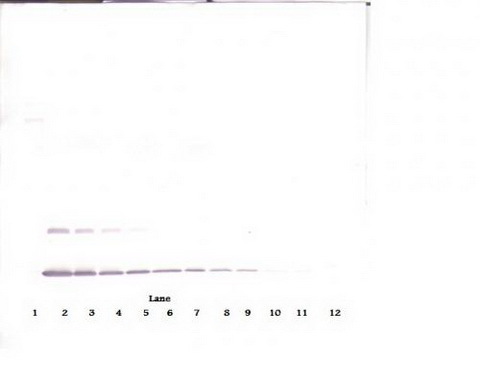 Detection occurred using peroxidase conjugated anti-Rabbit IgG (p/n 611-103-122) secondary antibody diluted 1:40,000. 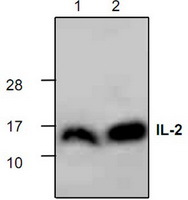 Western blot analysis of CTLL-2 cell lysate using IL-2 antibody. 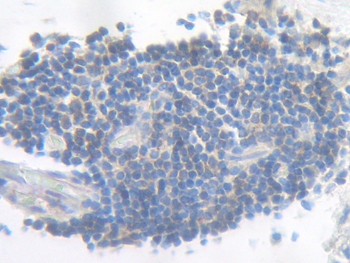 Immunohistochemistry of paraffin-embedded mouse spleen using IL-2 antibody at dilution of 1:100 (200x lens). 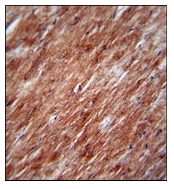 Immunohistochemistry of paraffin-embedded mouse spleen using IL-2 antibody at dilution of 1:100 (400x lens). 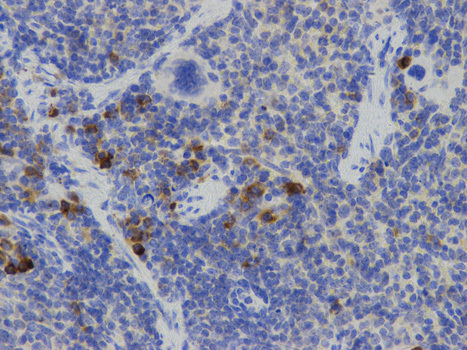 Immunohistochemistry of paraffin-embedded human liver cancer using IL-2 antibody at dilution of 1:100 (200x lens). 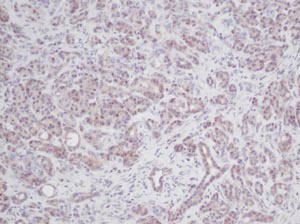 Immunohistochemistry of paraffin-embedded human esophageal cancer using IL-2 antibody at dilution of 1:100 (200x lens). 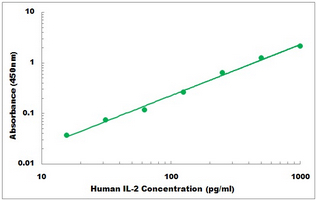 To detect hIL-2 by direct ELISA (using 100 ul/well antibody solution) a concentration of 0.25-1.0 ug/ml of this antibody is required. 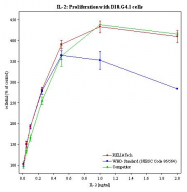 This biotinylated polyclonal antibody, in conjunction with compatible secondary reagents, allows the detection of at least 0.2-0.4 ng/well of recombinant hIL-2. To detect hIL-2 by sandwich ELISA (using 100 ul/well antibody solution) a concentration of 0.25-1.0 ug/ml of this antibody is required. This biotinylated polyclonal antibody, in conjunction with Polyclonal Anti-Human IL-2 (TA328207) as a capture antibody, allows the detection of at least 0.2-0.4 ng/well of recombinant hIL-2. To detect hIL-2 by sandwich ELISA (using 100 ul/well antibody solution) a concentration of 0.25-1.0 ug/ml of this antibody is required. 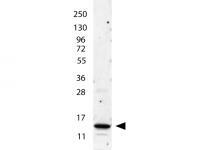 This biotinylated polyclonal antibody, in conjunction with Polyclonal Anti-Human IL-2 (TA328206) as a capture antibody, allows the detection of at least 0.2-0.4 ng/well of recombinant hIL-2. 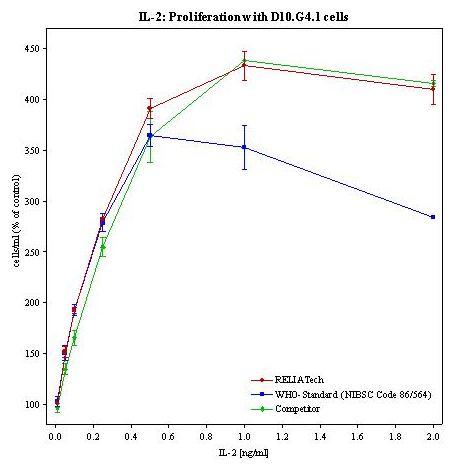 To detect hIL-2 by sandwich ELISA (using 100 ul/well antibody solution) a concentration of 0.5 - 2.0 ug/ml of this antibody is required. 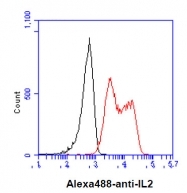 This antigen affinity purified antibody, in conjunction with Biotinylated Anti-Human IL-2 (TA328205) as a detection antibody, allows the detection of at least 0.2 - 0.4 ng/well of recombinant hIL-2. To detect hIL-2 by sandwich ELISA (using 100 ul/well antibody solution) a concentration of 0.5 - 2.0 ug/ml of this antibody is required. 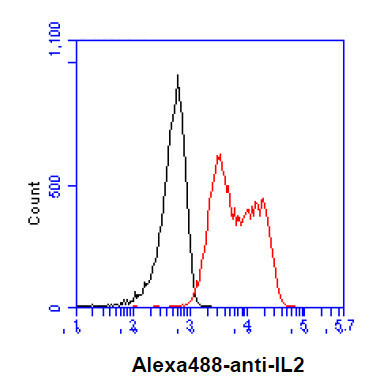 This antigen affinity purified antibody, in conjunction with Biotinylated Anti-Human IL-2 (TA328204) as a detection antibody, allows the detection of at least 0.2 - 0.4 ng/well of recombinant hIL-2. 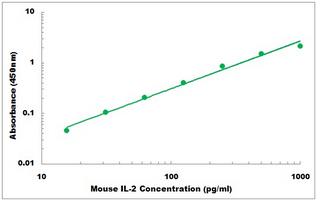 To detect mIL-2 by direct ELISA (using 100 ul/well antibody solution) a concentration of 0.25-1.0 ug/ml of this antibody is required. This biotinylated polyclonal antibody, in conjunction with compatible secondary reagents, allows the detection of at least 0.2-0.4 ng/well of recombinant mIL-2. To detect mIL-2 by sandwich ELISA (using 100 ul/well antibody solution) a concentration of 0.25-1.0 ug/ml of this antibody is required. 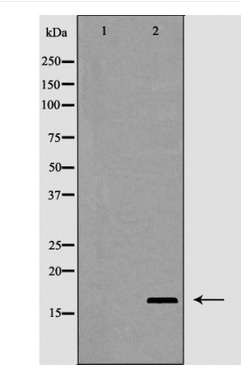 This biotinylated polyclonal antibody, in conjunction with Polyclonal Anti-Murine IL-2 (TA328481) as a capture antibody, allows the detection of at least 0.2-0.4 ng/well of recombinant mIL-2. To detect mIL-2 by sandwich ELISA (using 100 ul/well antibody solution) a concentration of 0.5 - 2.0 ug/ml of this antibody is required. 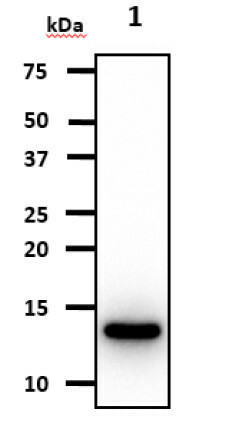 This antigen affinity purified antibody, in conjunction with Biotinylated Anti-Murine IL-2 (TA328480) as a detection antibody, allows the detection of at least 0.2 - 0.4 ng/well of recombinant mIL-2. 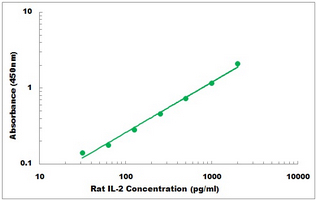 To detect Rat IL-2 by direct ELISA (using 100 ul/well antibody solution) a concentration of 0.25-1.0 ug/ml of this antibody is required. This biotinylated polyclonal antibody, in conjunction with compatible secondary reagents, allows the detection of at least 0.2-0.4 ng/well of recombinant Rat IL-2. To detect Rat IL-2 by sandwich ELISA (using 100 ul/well antibody solution) a concentration of 0.25-1.0 ug/ml of this antibody is required. This biotinylated polyclonal antibody, in conjunction with Polyclonal Anti-Rat IL-2 (TA328567) as a capture antibody, allows the detection of at least 0.2-0.4 ng/well of recombinant Rat IL-2. 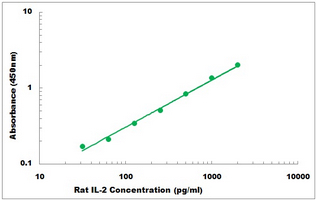 To detect Rat IL-2 by sandwich ELISA (using 100ul/well antibody solution) a concentration of 0.5 - 2.0 ug/ml of this antibody is required. 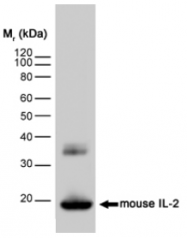 This antigen affinity purified antibody, in conjunction with Biotinylated Anti-Rat IL-2 (TA328566) as a detection antibody, allows the detection of at least 0.2 - 0.4 ng/well of recombinant Rat IL-2. 127 products - FILTER YOUR RESULTS!